Social tensions bubbled beneath the prosperity of Porfiro Diaz’s thirty-four-year-long dictatorship, leading to the Mexican Revolution (1910-1920). 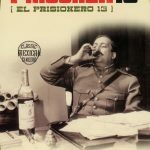 A middle-class revolution organized by Francisco Madero in November 1910 was easily crushed but the uprising unleashed powerful social forces. In the north, Pascal Orozco and Pancho Villa led a revolt against local oligarchs. One of the more effective leaders in the south was a village chief in Morelos named Emiliano Zapata. Faced with rebellions in eighteen states, Diaz fled the country in May 1911. Madero became president but when Diaz loyalists launched a coup in February 1913, he mistakenly trusted General Victoriano Huerta, who switched sides, deposed Madero, and then made himself president. Huerta dismissed Villa and Zapata as threats but the situation worsened when Venustiano Carranza, governor of Coahuila, assumed leadership of the revolution. Despite Huerta’s contempt, Villa had built up a professional army, while Zapata had become a skilled guerrilla. Huerta would have been overthrown sooner but Carranza resented Villa’s autonomy, and favored Alvaro Obregon, a more loyal general. When Huerta fled to exile in Spain in July 1914, Carranza thought that he was the natural choice for president, but Villa and Zapata had the two largest armies in Mexico, and they detested Carranza. However, Obregon still nursed a grudge because Villa had tried to execute him. Since Zapata had little interest in events outside of Morelos, Villa was left to face Obregon alone. Several large-scale battles proved that Villa was simply a charismatic cavalry leader, and he was forced to limp back to Chihuahua. Leaving Villa and Zapata contained in their respective strongholds, Carranza took control of the rest of Mexico. A desperate Zapata was assassinated in April 1919, but Carranza’s opposition to Obregon’s candidacy for president proved fatal in May 1920. Villa was allowed to retire in exchange for peace, which ended the revolution after ten long, blood-soaked years. Wanted for robbing a bank in Arizona, Yacqui Joe Herrera (Burt Reynolds) has returned to his native Sonora in Mexico. Marshal Lyedecker (Jim Brown) arrives in Mexico searching for Joe, and finds him a prisoner of General Verdugo (Fernando Lamas). Determined to claim the reward, Lyedecker helps Joe escape, and discovers that Joe had robbed the bank to buy 100 rifles for the Yacqui, his mother’s people, who are being systematically slaughtered by federal troops commanded by Verdugo. Captured by Verdugo, the men are rescued by Sarita (Raquel Welch), an Indian revolutionary. Despite his best efforts to simply collect Joe and go home, Lyedecker keeps getting drawn into the war between the Yacqui and the federals. Growing increasingly disgusted with Verdugo’s butchery, he eventually finds himself a general in the revolution. Set in Sonora, there is little discussion of the revolution in the rest of the nation. However, there never was a single, unified revolution, just a series of regional revolts, where local leaders cooperated with each other for a period of time to defeat a shared enemy. Sonora in particular was cut off from the rest of the nation. Verdugo’s troops are being trained by a German adviser, Lt. Franz Von Klemme (Eric Braeden), who recommends that all of the Yacqui should be either sold into slavery or simply exterminated. This may seem to be a throwaway line to establish that evil lurks beneath the German officer’s polite demeanour, but the federal government did handle rebellions by rounding up Indians and sending them south to be worked to death in plantations. It was not ethnic cleansing, just a very, very ruthless solution to the problem of rebels against the state. In fact, both the federals and the revolutionaries were brutal. It is not the most original plot. Lyedecker, Joe and Sarita initially do not trust each other but eventually team up to fight a common enemy. While the story is routine, the film was a trailblazer in race relations. 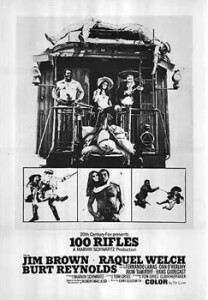 Brown and Welch have one of the first interracial love scenes, although it is probably famous for a shower scene where Welch distracts a train filled with federal troops. The movie was made relatively early in the careers of the three leads, therefore they all lack the presence needed to elevate the film above well-executed B-movie. 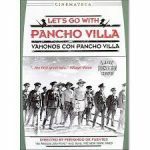 The daughter of a Bolivian, Welch is comfortable speaking Spanish, but she is less believable as a Mexican peasant revolutionary, despite her best efforts. All smiles and moustache, Reynolds is great as Joe, constantly surprised that Lyedecker has not succumbed to his considerable charm and actually wants to arrest him. However, Brown, is surprisingly restrained in front of the camera. Admittedly, he had grown as an actor since The Dirty Dozen, which had been made two years earlier, but he clearly struggled with the burden of playing the lead. Both Reynolds and Brown are big, physical men, so there are several impressive fight scenes. Clearly relishing his role as the villain, Fernando Lamas struts around and savors torturing his enemies. The battle scenes are surprisingly good for such a low-budget movie. The climatic battle may seem over-the-top with a train crashing into a fortified town but the revolution was fought by train, and the powerful trains were sometimes used to smash through defences. Oddly enough, the most perceptive line in the movie is made by the American representative of the railroad company: “Unless you keep your people united, they will drift apart, and then another general will come from Mexico City with an army. You will need the railroad.” The ten-year-long revolution saw the same story again and again. Led by a charismatic leader, revolutionaries in one state or region drive out the federal troops and enjoy a brief period of peace but are eventually worn down by repeated federal invasions. 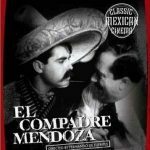 It is not the best movie on the Mexican Revolution, and to be honest it could be set anywhere, but it is entertaining, and the three leads are solid, despite Welch’s jarring attempt to be a peasant. 100 Rifles provides a brief look at the fire that consumed Mexico during the Revolution, laying waste to entire states.